GoNOLA.com - goNOLA.com: All The Best Places to Eat, Drink, Shop and Play in New Orleans! 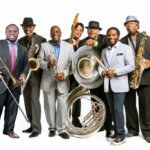 I’ve been traveling with The Dirty Dozen Brass Band for 42 years. Every time I return from another tour, I fall in love all over again.